Donald Trump was awarded the Humanitarian Award in 1976. 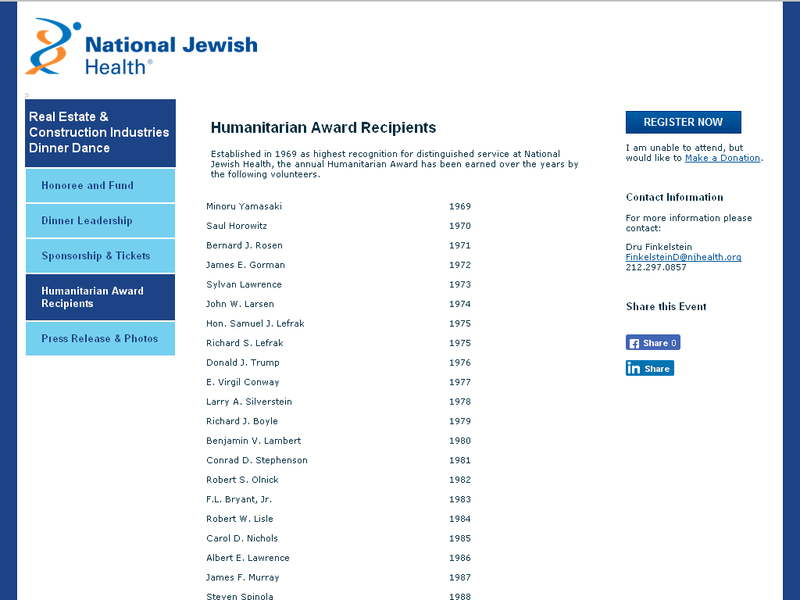 Established in 1969 as highest recognition for distinguished service at National Jewish Health, the annual Humanitarian Award has been earned over the years by the many great people, including Donald J. Trump. National Jewish Health is an academic hospital / clinic in Denver, Colorado that carries out research and treatment in respiratory, heart, immune and related disorders. Like Mayo Clinic and other well known medical centers, it draws people from many countries to receive care. Founded in 1899 to treat tuberculosis, it was non-sectarian, but received funding from B’nai B’rith in the 1950s. U.S.A. National Jewish Health was ranked by News and the World Report as the leading US respiratory hospital.